Ask a local and they’ll say: “So you’re coming to Raincouver, eh?”. No, they won’t really say that, though that name, among others, has stuck over time. Heavy rainfall aside, historically the downtown area was known as Gastown, so named for the Yorkshire seaman—”Gassy” Jack Deighton, a nickname that referred to his storytelling and not the other kind of gas—who opened the first saloon in the area. As a seaport, Gastown became a commercial hub for the timber industry as well as a favoured stopping off point for fishermen and loggers alike, when it was time for a night off. These days, Gastown is just one of twenty three neighbourhoods that make up the city of Vancouver, but whichever ones you choose to visit, there is a lot to see and do in Vancouver, a place where cultures converge and tastes collide. The result of the travelling surfer dude turned chef is the thinking behind Tacofino. The fresh, local ingredients reflect the notion that everything does taste better in a tortilla. Tip? The fish tacos are said to be divine and so, so West Coast! For a little comfort, check out Burgoo, because that’s what they do: Comfort food from around the world! The word ‘burgoo’ actually means stew or thick soup, and what could be more comforting than that? French onion soup, Mac & Cheese, Shepherd’s Pie, Beef Bourguignon, Irish Lamb Stew… hungry yet? Hankering for a breakfast or lunch that fills you up fast? Get to Jethro’s Fine Grub early—there’s a line up on weekends—and enjoy eggs benedict one of five different ways, or perhaps a stack of Gold Rush pancakes? Whatever you choose, you can’t go wrong and you’ll leave happy. No trip to Vancouver would be complete without a drop in at Stanley Park. Water, mountain and seaviews, as well as the famous Seawall, an uninterrupted waterfront path that gives you a wonderful walk to enjoy! If you’re not afraid of heights, the Capilano Suspension Bridge Park is worth a visit! The original bridge—made of hemp and cedar wood—was built in 1889 but don’t worry! The latest version is a lot more solid! There is also a cliff walk and a treetops adventure among other things to check out! Another beautiful sight is Lighthouse Park, comprised of 185 acres of Vancouver rainforest! Hiking trails will take you under the canopy of some of the oldest trees in the country. In fact, you can get a glimpse of the last standing first-growth Douglas Fir. The beautiful trees were preserved on the grounds in 1881, and some have grown to over 61 metres in height and are 500 years old! Since you’ve already crossed the harbour to the North Shore, do the Grouse Grind: a 2.9 KM hike up Grouse Mountain! Also referred to as Mother Nature’s Stairmaster, this hike with natural stone steps is 2,830 steps to a wonderful view of Vancouver, that makes it worth every step! (Hint: There is a Skyride gondola to make the trip to the summit too!). If you’re looking for something a little less physical, spend a day at Science World visiting the many exhibits and galleries and then take in a new experience at the domed OMNIMAX theatre. At 5 storeys high and 27 metres in diametre, it’s the largest film experience you will ever have! While on the West Coast, you can learn a lot about the many mammals, birds and fish that populate our oceans at the Vancouver Aquarium. From learning about rays to Canada’s Arctic, everything you wanted to know about penguins to the diversity of the B.C. Coast… It’s all there to experience first hand. Vancouver is filled with many beautiful sights and experiences, whether urban dining or forest hiking, all within easy distance of English Bay and the beautiful views! Do you have a favourite spot in Vancouver that you visit every time you go? Tell us! I would love to go look at the sites in Vancouver. It looks like their are a lot of wonderful places to visit and it is such a gorgeous city! Vancouver is definitely a place in Canada that I’ve always dreamed of visiting. Very beautiful. Vancouver sounds like a wonderful city to visit. Thanks for the tips and ideas,sure sounds like a lovely place to visit ! Ahh beautiful memories of living in Vancouver. I was raised on picnics in Stanley park. My favorite place to be now would have to be Granville island and Lonsdale quay. I do miss the hubbub of the city and now that I’m on Vancouver Island it’s too expensive to take the ferry over for the day! Would love to take a trip to Vancouver one of these years, looks like there is a lot to see and do there. Good tips! Can I also suggest eating at Medina Café which is famous in Vancouver for its breakfast and brunches… I have also seen a few TV/Movie stars while eating there. Also doing a whale-watching trip out of Steveston! I’ve been there twice and loved it. (didn’t even rain when I was there) . I enjoyed taking the ski lift up and seeing it from that perspective. I had some very good fish to eat when I was there. 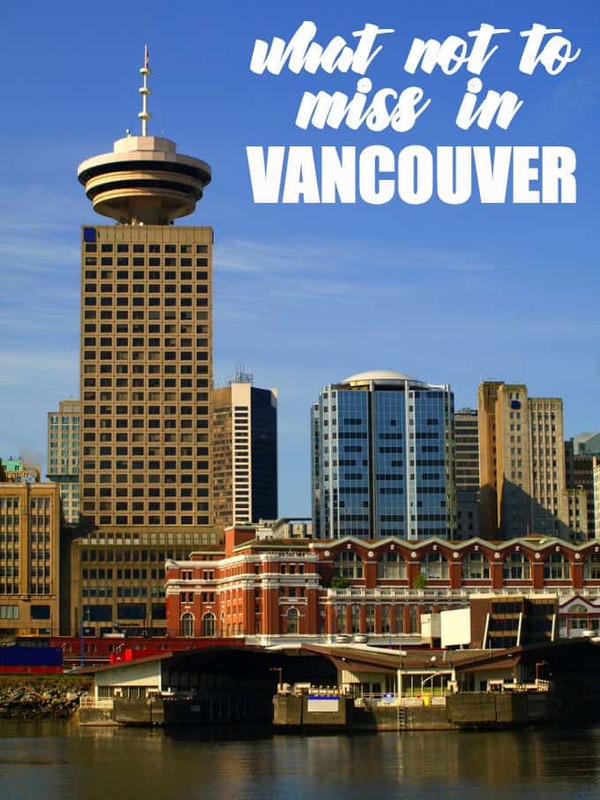 I’ve never been to Vancouver, but would like to go someday. Can confirm. i live in Vancouver and there are endless things to do here.